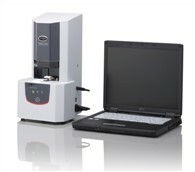 Shimadzu Scientific Instrument’s BioSpec-nano is a dedicated spectrophotometer for the quantitation of nucleic acids. Life Science researchers can conserve precious samples and obtain accurate and reproducible results made possible by an automated precision drive mechanism. The BioSpec-nano only requires 1 µL (path length: 0.2 mm) or 2 µL (path length: 0.7 mm) of sample, which is pipetted onto the measurement plate. For ultra-small sample volumes no standard rectangular cell is needed, although for applications that are not volume-limited, an optional rectangular cell adapter is available. With the most automatic functionality available on the market, sample mounting, measurement and cleaning are conducted by the instrument. The operators need not perform tedious, repetitive, and inconsistent placement of the fiber optic element and manual cleaning required in other instruments. Sample measurement time is 3 seconds. Dedicated software allows simple and quick operation of the BioSpec-nano. The start, exchange wiper, list, detail, save CSV/PDF and display PDF operations are displayed on the toolbar according to the user’s procedure and available with the click of a button. The BioSpec-nano is an ideal instrument for research in genomics, molecular biology, agriculture, medical science and food quality. Perform analysis with 1µL to 2µL samples. For ultra-small sample volumes no standard rectangular cell is needed although for applications that are not volume-limited, an optional rectangular cell adapter is available. With “drop-and-click” functionality, analysis has never been easier. Simply drop the sample onto the target and click the button. Sample mounting, measurement and cleaning are conducted by the instrument, eliminating the need for operators to perform the tedious, repetitive, and inconsistent placement of the fiber optic element and manual cleaning required in other instruments. Measurement takes seconds, and a series of samples can be analyzed while confirming spectra in the Detail view mode. Enables the quantitation of simple proteins and proteins labeled with Cy3 and other labels. Below is an example of the quantification of Lysozyme labeled with the dye AlexaFluor-546. The concentrations of protein, label and the label ratio are easily determined. Can I use this machine for measurement of cell density of bacteria at 600 nm? There are no threads in Shimadzu BioSpec-nano Reviews at this time.